The first morning of 2017, I wrote a blog about chasing down fear and designing my best life. You can read about my decision to live powerfully and creatively HERE in my blog titled, "Go Ahead, Write Your Story." That decision created room to not only pursue my novel, but it also made room for me to create The Vignette Box–two of them! 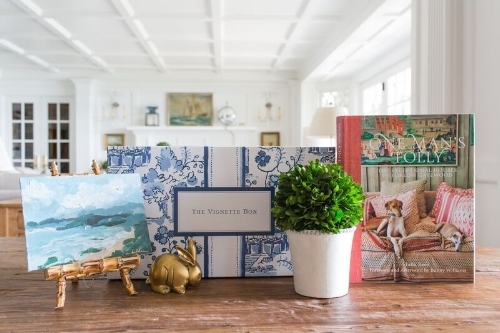 I had no idea that writing that blog would lead to me starting my own business, The Vignette Box By, Sweet Shady Lane. The goal of the box was to inspire others to find their own inner designer with a starter kit meant to touch, move and ignite a belief that you too could design your own story through design. The box is filled with treasures, to give or receive, that create the perfect vignette for a side table, mantle or shelf. I made sure that each box is filled with items that I would personally purchase, and that each item worked seamlessly together or could be separated and placed with other items in your home. How did she do that? Well, I already had started a design instagram @sweetshadylane (another Go ahead, Write Your Story, I've Got Your Back kind of moment) and found the courage to create The Vignette Box. Honestly, I had to go back to my own advice many times–reading my own words about living powerfully and creatively helped keep me in pursuit of following through (there were many moments where I literally said, what am I doing?) However, my own doubts and fears led me to believe (even more) that the language we use is powerful! I could have quit right when doubt crept in, thrown in the towel and believed all the lies that fear shouts in my ear, but somehow my instagram grew, I curated, designed and sold two successful vignette boxes (I still cannot believe this!) and I hired an editor for my novel. Even saying this out loud gives me goosebumps! That success did not come easy. In fact, every night, (EVERY NIGHT) I went to sleep wondering if anyone would actually buy my box and I'd wake every morning in utter disbelief–as a notification of a new sale was in my inbox..."A new order for Sweet Shady Lane. "I'd sit, sleepy eyed, staring down my computer screen like it was a liar. Similarly, every time I sit to write my novel, I have to put my boxing gloves on because I know the routine..."Here we go again, she thinks she can write." It's exhausting, sometimes debilitating, but worth the fight if you can push past fear and doubt and see success (whatever that looks like for you.) For me, success is typing the first sentence, showing up when I don't think I have anything to say, taking a picture of a vignette and sharing it with my followers and just knowing that at the end of everyday, I stayed true to living powerfully and creatively, even if I had to do some fighting along the way. 2017 has taught me a lot. I've learned about handling and shipping, I've been able to know my tax guy personally (his name is Cory), how to start retail accounts, learn how to use squarespace (I have my amazing daughter, Emmie to thank for that), and how to curate something that I believe is special and unique. If I've learned anything in 2017, it's this...Anytime you are working in truth and trusting your gut...You will succeed! So, what's in store for 2018? You'll find me at ModernWell (my new writing haven) A women-centered creative community driven by wellness and possibility. I'll be finishing my novel (notice how I didn't say, "I hope to be finishing my novel.) If you're in the Twin Cities...come check it out! I'm also thrilled to be currently working on an a la carte vignette design experience, in which you decide what items you love and would work well with your already purchased treasures. There will be choices with different price points so that people who love Sweet Shady Lane can own a piece that's just right for them! Here's to living powerfully and creatively! Wishing you the BEST in 2018.